“Music has always been a part of me. I’ve been writing songs since I was nine years old and decided to learn guitar after attempting to teach myself chords on my grandpa’s old Conn until I couldn’t feel my fingers. I got my first guitar for my 10th birthday and the rest is history.” Growing up, Mason was greatly influenced by the music her parents listened to including early John Mayer, Matchbox 20, and Maroon 5. She later became infatuated with Bob Dylan’s writing style that went on to open up a whole new realm of songwriting for her. 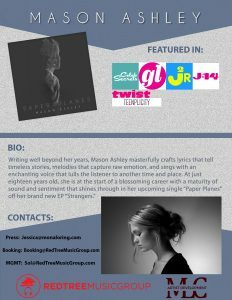 Instead of trying to categorize her unique sound into specific genres, Mason describes her sound as “what she feels like writing, what she is feeling in the moment, and what she feels is honest.” Her music is her own journal of her life, just with melodies. The result; songs that anyone of any age who has ever felt love, loss, frustration, joy, romance can relate to. Her upcoming single “Paper Planes” was inspired by a relationship she knew was bad for her. Struggling with a song title for months, it wasn’t until she was folding laundry and saw an old pair of pajama shorts with little white paper planes on it that she created the metaphor for this toxic relationship. She went on to finish writing the bridge a few hours before leaving for a show and performed the song live that same night for the first time. Her full EP titled “Strangers” is truly a diary of the past two years of her life. Listening to the body of music, it is a tale of how Mason dealt with various situations while going through a transitional time. While trying to figure out exactly who she is, Mason wrote most of the songs in under an hour, late at night, during times of confusion and mixed emotions. The EP was a way for her to sort her feelings out on paper. Mason is often found surrounded by extended family, all with instruments in hand, wrapped in a big comfy quilt on a porch in the starlight singing, laughing, and playing. Simplicity, faith, and family are of upmost importance to her. When she is not writing, recording, or performing music, she is working hard at cosmetology school to get her license. Having the opportunity to help women and men feel beautiful and confident through cosmetology is a truly inspiring experience for her. Dedicated to using her voice and platform to make a difference, Mason is a huge supporter of the Alzheimer’s Association, a disease that her great grandmother has suffered with for over ten years. Watching her go through that since Mason was a child has had a huge impact on her – so much that she wrote a song about it when she was 12. Her goal as a musician is to never stop learning. To always push herself and never let her career be something that she does because it becomes routine. When she was younger, she would ask for a different instrument every year for birthday. She wants to always have that mentality of her younger self that felt excited for a new challenge.